My Cards Were Seen Times. Can You Say Play Ball! 1. 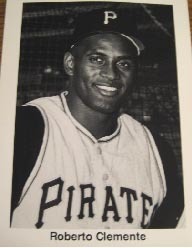 RARE ORANGE MANTLE HOF PLAK CARD-$75. 1b.ARTHUR MILLER POSTCARDS- ALL $10 EACH. 1c. 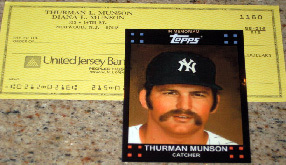 1975 tcma all time yankees set with Mantle- $50. 1d. 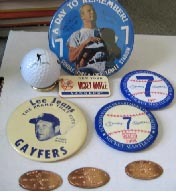 MICKEY MANTLE LOT OF PINS, KEY CHAIN, GOLF BALL, AND 3 HOF PENNIES- $75. 2. 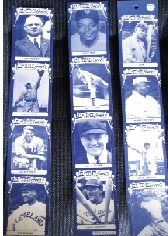 1975 TCMA ATG MINI CARDS- STRIPS OF 4- COBB, JACKIE ROBINSON, W. ROBINSON, Z.WHEAT-$40, SHEET #2- M.IRVIN, LEFTY GROVE, J.CONLON,D.MEDWICK-$25, SHEET #3J.McGRAW, R. YOUNGS, J. BOTTOMLY, TRIS SPEAKER-$25. 2b. 1975 TCMA MINI SINGLES- NEAR SET inc the rare 2nd ruth card-NO MANTLE- $100.INCLUSES COBB,RUTH(2),JACKIE ROBINSON, FORD, J.FOXX,SPEAKER, SISLER, McCARTHY, B.GRIMES, LANDIS, AVERILL, HUGGINS, HARRIS,B.HERMAN,ETC. WILL SELL SINGLES. 2c. ROGER MARIS LOT OF 3- SD CONVENTION CARDS #15, #16,AND GREAT PLAINS GREATS-$20. 2d. 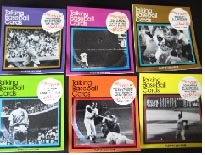 TALKING BASEBALL RECORDS SINGLES-$20 ea.- MAZEROSKI, BUCKY DENT, HANK AARON, BABE RUTH, CARLTON FISK, DON LARSEN, REGGIE JACKSON, WILLIE MAYS CATCH, ROGER MARIS 61HR, 69 METS, BOBBY THOMPSON- $20 EACH. 2e. LOT OF 21 RENCONTRE SPORTS ILLUSTRATED CARDS-LOT OF 21 SUPERSTARS-$125- inc ALI, SIMPSON, J.BROWN, 69 METS, W.CHAMBERLAIN, JABBAR, SAYERS, B. RUSSELL, BENCH, PELE, BLANDA, AARON, UNITAS, ERVING, J.LOUIS, NAMATH,W. FRAZIER, J.OWENS,G. HOWE, B.OOR, PHIL AND TONY ESPOSITO. 2f. 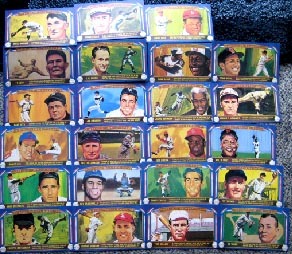 LOT OF 42 LAUGHLIN-300-400-500 inclusing RUTH,GEHRIG,JOE JACKSON-2 NR. SETS(missing 3)- $85. 2g. 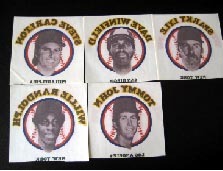 RC COLA IRON ONS FROM 70'S-80'S- WINFIELD-$20,CARLTON-$10, RANDOLPH,TOMMY JOHN-$10EACH. 2h. 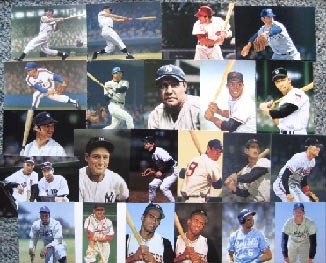 ART BROWNELL 8 X 10'S- $25 EA: COBB, CAMPANELLA, AARON, RIZZUTO, GEHRIG, BENCH, BROOKS ROBBY, DUKE SNIDER, JACKIE ROBINSON. 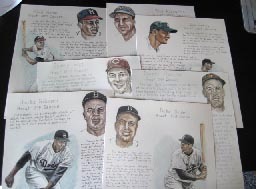 $20 EACH- PALMER, MEL OTT, ALLIE REYNOLDS, MARTY MARION, TED KLUZ, LOU BOUDREAU, SPAHN, CHARLEY KELLER, R. HORNSBY, C. HUBBELL, GEHRINGER, BOB FELLER, BILL DICKEY. 2i. LOT OF 31 LAUGHLIN GREAT AND FAMOUS FEATS- $25. 2j. LOT OF VG 1982 AND 1984 TCMA POSTCARD SIZE ISSUES INCLUDING TED WMS, MARIS, CLEMENTE, KOUFAX, JACKIE ROBINSON, KILLEBREW- 26 DIFF-$20. 4. 1987 PETE ROSE FLEER STAR STIX- 3 DIFF-$20 EACH. 5. 1970'S PETE ROSE (JIM ROWE) POSTCARD WEARING #27-$45. 10b. 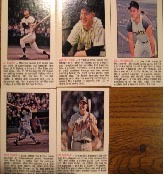 2 roger maris odd ball cards- batting tips card-$25, g.s.gallery-$15. both for $30. 10c. 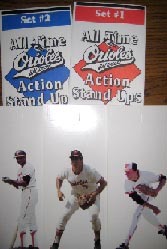 1984 orange national cards- MAYS-JACKIE ROBBY, DUKE SNIDER, HODGES, FORD, BERRA, REESE- $10 EACH. 10d. 1971 dell all-star uncut sticker sheets- includes SEAVER, YAZ, BANKS, GIBSON, BENCH, MAYS, KALINE, REGGIE(rookie),PETE ROSE, CLEMENTE, AARON, BROOKS ROBINSON, KILLEBREW, ETC. BOTH SHEETS FOR $75. 10e. 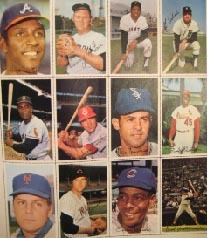 1970 Sports Stars Sticker Sheet with book: Stottlemyre, Bench, Aaron, Seaver,Gibson,Killebrew,etc.-$25. 10f. 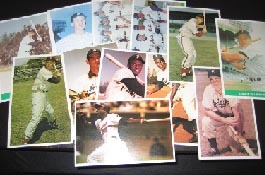 LOT OF 6 BATTING TIPS CARDS INC MAZ, WARD, J.GENTILE, KALINE, FORD, K.BOYER, FRANK ROBINSON.-$20. 15. REGGIE JACKSON ACCEL CHEVY CARDS- 2 DIFFERENT-$25EA. 16. 1997 SONY SPRINT REGGIE JACKSON PHONE CARDS-4 DIFF-$10EA. 17. 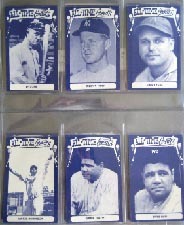 1997 SONY SPRINT BABE RUTH PHONE CARDS- 4 DIFF-$10 EA. 20. 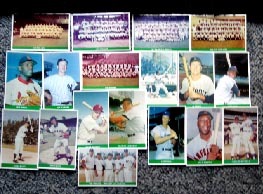 TED WILLIAMS MUSEUM POSTCARDS-3 DIFF-$10 EACH. 22. SANDY KOUFAX- HEROES,FEATS,& FACTS-$10. 31. 1973 WILLIE MAYS BATTING TIPS CARD - $35. 2 DIFFERENT MANTLE CALENDARS ALSO AVAILABLE. $25. 37. 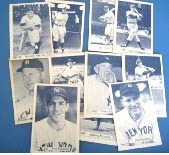 DAVCO TRUE VALUE 4 X 7 SINGLES: MANTLE-$40,SANDY KOUFAX , WILLIE MAYS, JOE DIMAGGIO, BABE, AND LOU-$10 EA. ALSO SELLING LOT 40 FOR $85 PPD. 40. 1987 MIKE SCHMIDT FLEER STAR STICKER-$20. 43. NOLAN RYAN GREEN CLASSIC GAME CARD-$15. lot of 48 1984 TCMA CARDS- $35. AND BEAUTIFULLY FRAMED AND MATTED. (OUT OF PRINT LITHO)- $1250. BROOKS ROBINSON AND AL KALINE-$40. 55. MANY REGGIE JACKSON ITEMS AVAILABLE FOR SALE. 56. MANY DON MATTINGLY ITEMS FOR SALE. 56a. 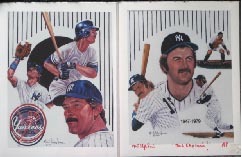 DON MATTINGLY-$20 AND THURMAN MUNSON(ARTIST PROOF)-$25 ROBT. SIMON 8 X 10 ART. 62. 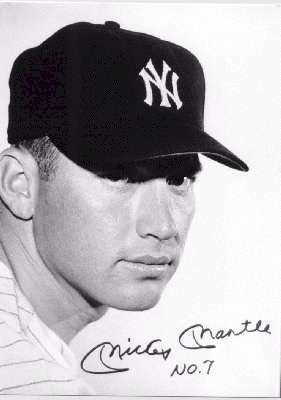 VARIOUS NEWPAPERS OF MICKEY MANTLE'S DEATH-$18EA. 63. 1950'S MICKEY MANTLE PIN BACK- LARGER SIZE -$60. 72. NOLAN RYAN ARTIST PROOF OF ROBT. SIMON'S,"TEXAS HOMECOMING"
SIGNED BY ARTIST 8 X 10- NICE-$35.